Don't touch the phone - even delivery isn't as easy, or as good, as this quick stir-fry! Heat oil in large nonstick skillet on medium-high heat. Add meat; cook 3 min. or until browned, stirring frequently. Add broccoli, hoisin sauce, dressing and ginger; stir. Cover. Cook 5 min. or until heated through. If you can't find beef stir-fry strips in your supermarket, use any grilling steak, cut into thin strips, instead. Substitute jarred minced ginger for the grated fresh gingerroot. 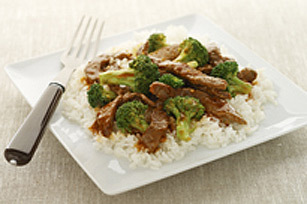 Substitute 2 cups frozen oriental stir-fry vegetables for the frozen broccoli.